My day to day experiences as a Nordstrom Intern. These past couple of weeks have been so busy for the interns. It was many of ours first experience with anniversary. We've also had classes, homework, reviews, meetings, and still made time for sells. I have to admit I'm pretty exhausted with all that has been going on! Luckily we have a pretty great store manager, (Helen), who provided us with some downtime and got us a really great lunch. It was a really good time to have all the interns together. Also, it was nice that Helen was there along with a few others from management. It feels great to be appreciated by everyone as interns, and to be thanked for all of our hard work! We had an amazing lunch from Panera Bread and we also had more cake! They made a slide show of all of us at work, or hanging with each other after hours, and also us as a group. We also played a game call "Who am I", and it was so fun to see how well we've all gotten to know each other during our time at Nordstrom. 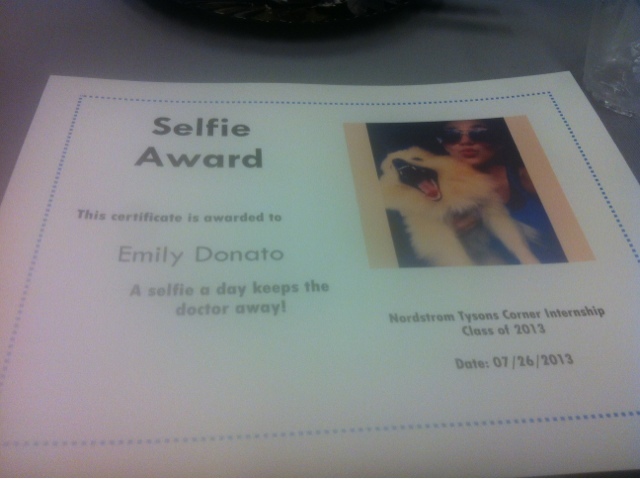 All the interns received funny little awards that had been voted on by our peers, and I won the best "selfie" award (haha). It was a really good time for all of us to just take a breather and realize that it's almost over! In the next three days I will be giving my presentation, graduating, and having my last one-on-one meeting with Helen! Wednesday is my last day, and I have to say I'm going to miss coming to Nordstrom every day! Social Media is a MUST!